Watch gray hair fade away. Grayban hair color restorer banishes the gray from your hair by going straight to the hair’s roots and progressively restoring its original color. Just apply the Grayban shampoo to dry hair once a day—you’ll see results after 7-14 days. 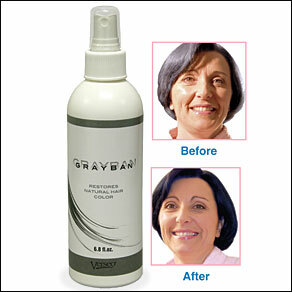 Grayban natural hair color restorer formula contains no harsh chemicals or dyes. Won’t damage, rub off or wash out of hair. 6.8 oz. I would like to restore my hair back to its original color.